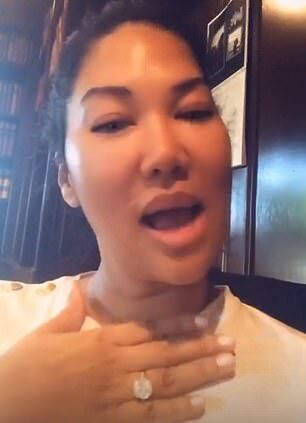 Kimora Lee Simmons is celebrating her daughter's acceptance into Harvard University at the age of 16, but not without throwing shade at actress Lori Loughlin who allegedly scammed her daughters' way into USC by having them pose as crew recruits. The model and fashion designer took to Instagram to celebrate her daughter Aiki Lee Simmons' acceptance into the Ivy League School. 'I'm so excited that Aoki got in Harvard… She really did it on her own merit and we’re really so proud because Aoki can’t row or anything like that,' Simmons said nearly on the brink of tears in a video. 'There was really no hope for us in that area. I’m just so proud that you did it on your own,' she echoed. Simmons threw shade at the college admissions scandal that threw exposed actresses Felicity Huffman and Lori Loughlin for allegedly bribing their children's way into esteemed university. In Loughlin's case, the Full House actress and her fashion designer husband are accused of paying a $500,000 bribe to get daughters Olivia Jade, 19, and Isabella, 20, into University of Southern California by posing as crew recruits. Following the scandal that broke this month, Loughlin's daughters have left USC . Simmons went on to note that not only did Aoki get into Harvard for her merit, she did it at the age of 16 and will be joining the Harvard class of 2023. 'I'm so proud of Aoki but I would just like to say Aoki is only 16 years old, so remember that. Class of 2023. Aoki’s only 16, honey, come in with that heat,' she added with a smirk. Aoki took to Instagram to gush about her exciting college acceptance and filmed a message from her mom. 'You cannot row. Your soccer skills are just a minimum, I know you play volleyball – and you’re really good at volleyball – but it’s not like you’re 6’4 and you’re gonna get in on that. This is the way to go. Just rely on your brain. Nobody can take that from you,' Simmons said to her daughter as she sniffled, overcome with emotion with the acceptance. Harvard wasn't the only school the teen got into. 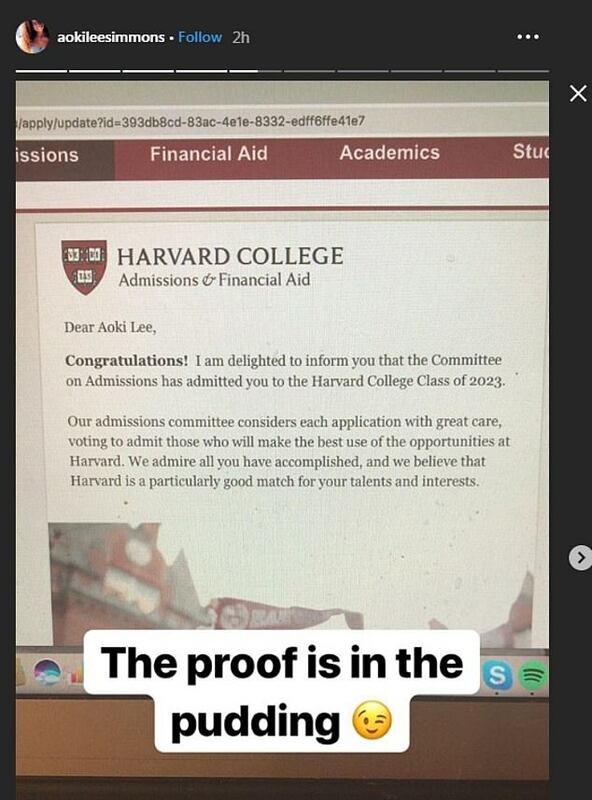 According to Simmons' instagram, Aoki also got into Dartmouth, Vassar, and Barnard. 'I’m only 16 and I’m going to Harvard baby! Insert emotional crying face,' Aoki wrote in her Instagram caption. 'Thank you so much to every single person who helped me along the way. I am excited and honored and so so grateful,' she dded. Earlier this month Loughlin posted $1million bail to be released from jail after she was arrested. She and her husband have been charged with conspiracy to commit mail fraud for paying to get their daughters into the school. Following the scandal Loughlin has been cut from the Hallmark Channel and her daughter Olivia Jade, a YouTube star and make-up guru, has had her partnerships with Sephora and TRESemmé cut.